As they did in the AUDL pre-season, Philly took first place in our Logo Review of the eight AUDL teams. The results of the recent 'Your Personal Spin' online poll on the Philadelphia Spinners' website "Battle of the LOGOS! Which AUDL team has the best team logo?" Ultimate has been written about before in Sports Illustrated (Nov 2011); and don’t forget about the superb illustrations of the sport. This lengthy SI article focuses on the AUDL as a start-up sports business (its current status) of Ultimate rather than detailing a drama-filled semi-professional sports league in its first season. The raw athleticism of the players is evident from the first throw, and many are built like shooting guards: Tall and lanky, but speedy with a sinewy strength and grace that allows them to make spectacular catches with impressive regularity. There are about 10 grabs each match that make the crowd "ooh" and "ahh" with appreciation. "You see guys throw 80-yard hucks right on the money, and guys run full speed up and down a football field over and over and over," says Moore. "It's endurance, it's speed, it's agility, and a lot of leaping. It really is an ultimate athleticism test for these guys. They may not be stronger than any other sport, but when you look at the things they're required to do on the field, it does take amazing athletic ability." One can only see in person the fluidity of the game. Players are constantly making overlapping runs and cutting at full speed, a hurricane of motion where the eye of the storm is the handler of the frisbee, rooted to his spot for a maximum of seven seconds while he decides where to toss the disc. Despite a structural similarity to football, ultimate most resembles soccer in the way the teams advance up and down the field. Cutters seek pockets of free space away from the defense, and some of the throws that the handlers make, leading their marks into open areas of the field free of defenders, are as exquisitely well-timed as anything Barcelona's midfield has produced in recent years. The internet based, grassroots marketing campaign has worked for the AUDL so far, as have the three clips that have made it onto SportsCenter's "Top Plays" on ESPN (One got as high as number three, featuring Connecticut's Brent Anderson laying out to make a nearly impossible catch in the end zone against the Spinners in May). Still, the Riccis, Moore and the other owners recognize that the league will need backing from a major company at some point to truly solidify its place as an entity that isn't just a one-and-done. It's this 'seeing-is-believing' approach that Steepe thinks will transform the AUDL into something more than a niche league. Even before going to a game, he says, both prospective fans and curious individuals alike should take some time to watch ultimate clips online. When asked how one person should try to explain ultimate frisbee to somebody who has never seen it, he responds, "Don't try and tell anybody about ultimate, just show them. They see a couple of plays or highlights, and they get it really fast. To anybody who poses that question," he says, "Tell them nothing, show them everything." As with many subcultures, ultimate has its own lingo, conventions and ideologies. The frisbee is referred to almost invariably as "the disc," and the throw-off to begin each half and after a score is the "pull." Admiration is reserved for those who can throw the longest and jump the highest, and backwards baseball hats seem to be the fashion du jour on the field. With frisbee's traditions, however, came a backlash against the AUDL as it took its first steps towards legitimacy. "When I first started introducing the idea to the general public, there was a lot of pushback, people were like 'You can't do this league because it's not done this way'," says Moore. Some ultimate lifers viewed a profit-making league as running contrary to frisbee's all-inclusive populism, and feared it would tank and give the sport a bad name in the eyes of uneducated observers. Others took issue with the changes made to game: The AUDL features referees -- a first for the sport -- a bigger field and slightly modified rules, all missteps in the eyes of hard-line ultimate conservatives. Even so, all the financial matters are secondary to Korber, his teammates and their counterparts across the league. They're here because they want to continue playing while still keeping their day jobs, and the league has given them the best opportunity to do just that. "I think it's easy to forget that it's a big, spread out, disjointed startup," he says. "For the first time ever, people are reliably paying money to watch ultimate. Which for all of the other things that are going on that aren't perfect or could be better, at the end of the day Josh's vision two or three years ago was 'I think ultimate is [a] game that people would like to pay to watch.'" "Our first home game, we had one thousand people come out. Looking up in the stands, everyone was excited, cheering, and pumped to be here, and the place was electric," he recounts. "I've played in front of fans. I've played in the national finals a couple years back, down in Sarasota, Fla., and there was probably a couple thousand that were there. This was a different feeling. I didn't go to sign autographs after that. At the end of these games you know we have high school kids coming out, college kids coming out, and they want to talk about the game, and they want to learn, and we never thought we would be part of this." Olympic medals may not be in the near future for the Ultimate sport, though an unofficial commemorative shirt with Ultimate & the Olympics can be worn around your neck. 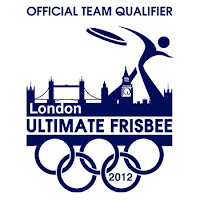 Info: This "London 2012 Olympics" tshirt features Ultimate Frisbee. White shirt with blue screen print of 'Official Team Qualifier' text against a London backdrop and a backhand disc throw. Professionally screen printed on a soft mid-weight (not too heavy, not too thin) preshrunk GILDAN ULT-shirt. 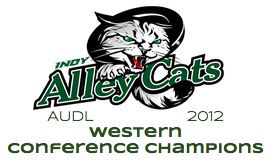 What are the odds that you can make sense of the AUDL playoff picture? After an irregular ending (forfeits, legal troubles, owner walkout) to the AUDL regular season, the top four-ish teams are scheduled for the playoffs. 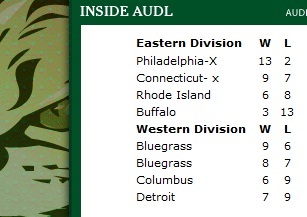 Based on the AUDL & Indy's posted standings, Connecticut was the 2nd place finisher in the Eastern Division. Weirdly, the Bluegrass finished #1 & #2 in the Western Division per Indy's online standings. Strangely, the championships are played on separate weekends. Further, the game site is based on either attendance &/or being centrally located to the divisional teams; not on best record. *= Connecticut Constitution (9-7) posted 4 straight losses due to suspended operations. Without explanation from AUDL, the Constitution were not invited to the playoffs. Found this amazing warning sign along a hiking trail along the beautiful Shawangunk Ridge in Ulster County, New York. Ultimate for professionals is different than professional Ultimate. This hand sign means "Frisbee"; another non-verbal signal using the hands is often heard while on the Ultimate field. Hand Clapping: The universal sign in Ultimate for "I am open". Usually employed by an offensive player while running. 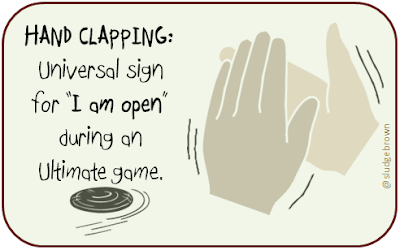 Alternative definitions: "I think I'm open" + "I want the disc!" 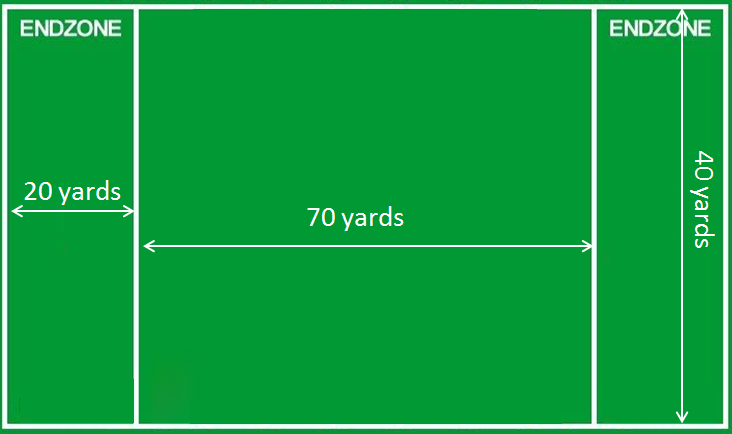 Causes for Ultimate fields being short may be: 1) the person who setup the field paced it off incorrectly, or 2) endzones are meant to be 20 yards. 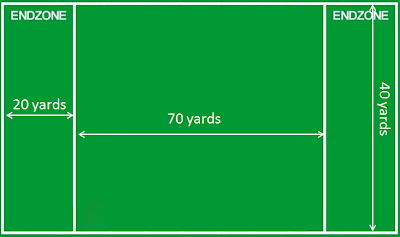 Endzone Size - Endzone length will be shortened to 20 yards. 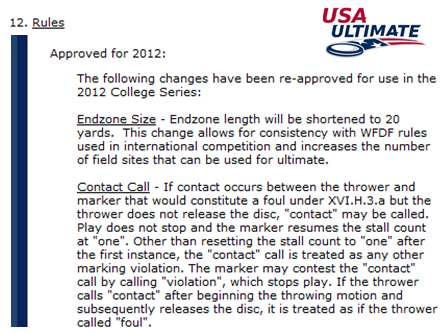 This change allows for consistency with WFDF rules in international competition and increases the number of field sites that an be used for ultimate. Specially-designed foot jerseys may worsen your borrowing odds of socks - an essential item for cleat-wearing Ultimate players. 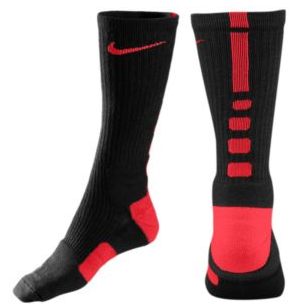 Info: This sock features a midfoot compression fit for a secure, stable design that helps keep socks & cushioning in place. 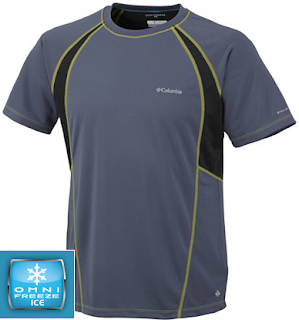 Dri-FIT® fabric wicks away moisture to keep feet dry & cool. Footstrike cushioning. Clearly defined pattern is more closely aligned to pressure patterns on the feet. Ergonomic left + right snug fit and cushioning. So many colors (Black, Blue, Green, Grey, Khaki, Orange, Pink, Purple, Red, White, Yellow) NO BROWN! 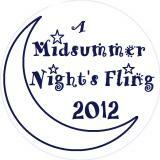 WHAT: The first annual A Midsummer Night's Fling Ultimate tournament is scheduled to start at 6pm and the Fling Kings will be crowned by Puck around midnight. A Midsummer Night's Fling offers a night-time alternative to the DC summer's heat, & 100% of proceeds will go to benefit Playgrounds for Palestine. Whether it's a missed "UP" call, not knowing the force, or having the thrower step through your mark, playing defense during an Ultimate game requires team work. However periodic, for defensive marks: Breaking. Bad! An Ultimate version of Carly Rae Jepsen's 'Call Me Maybe' song...a distressed defender seeks an UP call from their teammate. Don't ask me, I'm fronting. And somehow they've scored in my end zone. Pennies & dimes for a disc. But now they're in my end zone. Clogged lanes, no cuts were showin'. Where does the O think they're throwing, baby? 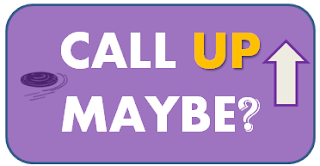 Yet, you took no time with the UP call. And now, they're in our end zone. But they're in our end zone. I helped you so bad! I yelled UP so proud!! I yelled UP so, so loud!!! I yelled UP so, so loud. 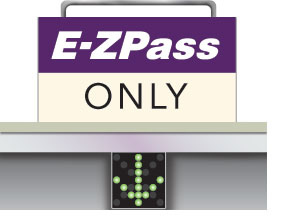 Travelling along the US east coast with Ultimate on the mind, E-ZPass - electronic toll collection - will now forever be linked to 'End Zone Pass'. 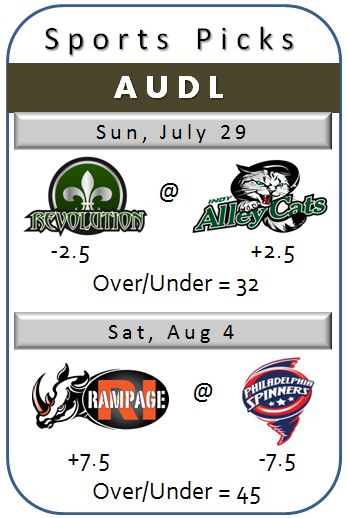 During week 12 of the AUDL season, two scheduled games were not played. One was postponed 3 days before without any explanation by either teams (or the AUDL). The other was declared a forfeit (by the AUDL) one day before. Postponement tweet on 6/27. No explanation. Forfeit announcement on 6/29 by Bluegrass Revolution. Upon further invesTWEETigation, Columbus understandably blamed the recent heatpocalypse as a factor for not playing, but they also contest the forfeit -- "Not a forfeit from us." Beyond team inactivity, the published AUDL rules dictate a forfeit is when a team cannot field 7 players; the head official determines a postponement -- as in Week 3. 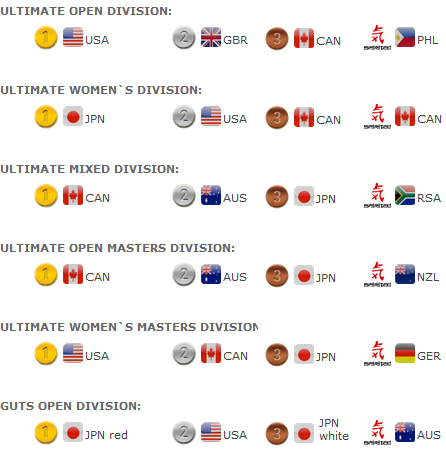 So, what criteria are professional teams of the American Ultimate Disc League using to determine game playability status? As an AUDL fan, I don't understand league governance. The AUDL Rule book [2012 Season . 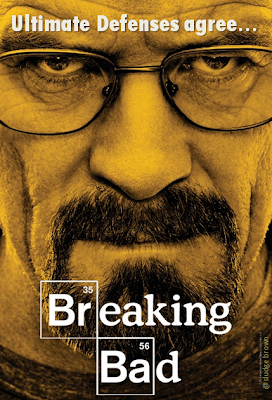 Version 1.1 - 3/29/12] is 27 pages long and details the specifics beyond the general rules. Each team shall field seven players. Each team shall have no fewer than 12 players from the active roster, in the proper uniform, able and ready to play at the beginning of each game. In the event that there are only seven eligible players remaining and one of these players is injured and must leave the game or is ejected, his team must forfeit the game if the injured player cannot return to play. Under "General/ C. GAME CANCELLATION"
a. For the purpose of game cancellation, the Officials' jurisdiction begins with the opening pull. Prior to this, it shall be the decision of the home management whether or not playing conditions are such to warrant postponement. However, once the game begins, if because of extremely hazardous playing conditions (such as lightning) the question arises whether or not the game should be cancelled, the head official shall see that EVERY effort is made to continue the game before making the decision to terminate or delay it. If a game is terminated before half time, all play is negated. If a game is terminated after half time, the game is over and the final score is the score at the point of termination of play. The AUDL makes NO mention of either in their "Week 12 Results." Again, how is a "forfeit" considered a 1-point victory (1-0). As someone who follows the AUDL, I would like some answers because there doesn't appear to be much accountability. An unexpected "force" by the CT Constitution as both CT & Rhode Island Rampage are being sued by the AUDL. What's the right call here? Disc Space! or Out of Bounds! Ah, the influence of dollars creating $pirit of the Game. It is with great sadness that we are forced to announce the indefinite suspension of all team operations as of 2:00pm EST this afternoon. This decision comes at an inopportune time as we journey through the inaugural season. This has been a journey dotted with success after success for our team and our franchise. The Connecticut team is one of the premiere franchises in the league both in victories and in fan attendance. The AUDL has sued the Constitution and the Rhode island Rampage and that suit has caused us to spend an enormous amount of money protecting our rights, instead of allowing us to use those funds for our operations. 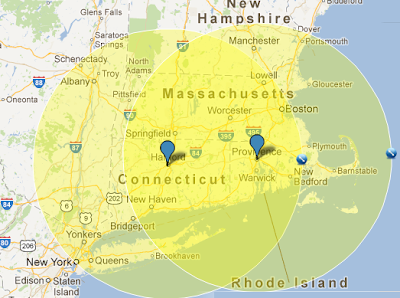 During May 2012, we became aware of the sale of both the New York City and Boston territories, and together with the Rhode Island owner, we challenged the League to answer why we were not approached about these sales prior to the League selling these territories inasmuch as both of these new teams existed within our owned territories. The territory ownership area is governed by a Territory License Agreement (TLA) that was created, signed and approved by the League. This territory agreement allows us to own an area that includes a 100 mile radius. 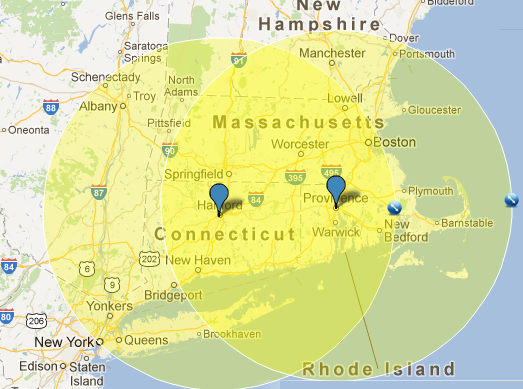 New York City and Boston are within our territories. We sought answers to our concerns numerous times and felt that the TLA was clear and that no other team could exist in our area. After numerous attempts to get clarification from the League, we suggested that this might need to be addressed by attorneys. Unfortunately, the League decided that instead of taking this to a discussion, they elected to file a suit against us. This lawsuit was filed from Michigan, and includes a number of allegations within their suit. They allege that the contract they wrote doesn't mean what it says, among other items. We have been forced to retain attorneys in both Connecticut and Michigan to answer their allegations, protect our territory and to seek additional clarification over these claims. The costs to defend this lawsuit have robbed us of necessary operating funds needed to complete our season and caused us to rethink the value of the partnership we sought to create with this League. The League, almost as quickly as it filed the suit, has stated that it will consider withdrawing the suit and rescind the New York City territory although in almost the same breath the League has offered to withdraw the suit and keep the territory and offer us no compensation for the taking of our territory, a territory that we have cultivated all season. The League continues to be silent about the Boston territory. Our organization cannot absorb the cost of these attorney fees and continue operational costs. In addition, we have requested that the League reimburse us for the attorney fees and the League has stated that they are not willing to do that. The League has decided to suspend discussions with us and simply report that we 'are unable to finish the season'. We adamantly deny this callous statement. Therefore, we are forced to indefinitely suspend our operations until the League withdraws the suit, rescinds the territories and makes us whole for these attorney fees. Our team will continue to operate as a unit during this suspension and we are ready to play on and we will continue our season as soon as we can get this issue resolved. A letter was issued today by the Connecticut Constitution indicating that the team is suspending operations indefinitely. As much as we would have preferred to settle the issues internally, their statement merits a response from the league. We do not wish for the case to be debated in the court of public opinion, yet wish to state how the situation came about. 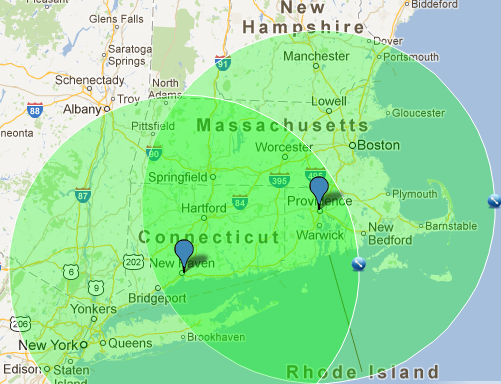 Before the AUDL was ever established, we set out to have teams in Boston, NYC, Hartford and Providence, among others. 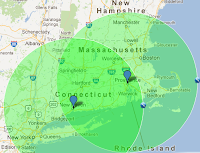 Our owners in Connecticut and Rhode Island both saw this proposal before and after signing on with the league and as we looked to continue to add teams to the league, were in agreement to get to 16 teams in the Northeast and target these regions. Based on this mutual understanding, the league proceeded to find owners in both Boston and NYC for next season, as these markets are essential for the growth and success of the AUDL. After the start of the season, the Connecticut and Rhode Island owners no longer wanted teams in NYC and Boston, after we already had owners ready to go. Their purchase agreements do indicate that no new teams, beyond what we agreed to at the start, may be placed with a 100 mile radius. However, as we set out as a league we mutually agreed to place teams in these markets both before and after Connecticut and Rhode Island teams came into existence. As part of their insistence that no teams be placed in NYC and Boston, they threatened legal action against the league if these territories were not rescinded. In response, the league filed suit to request judgment as to their radius being enforceable given that they had agreed to the teams previously, because we couldn't have this issue dragging on for months when teams in NYC and Boston have work to do to be ready for next season. We've been working to settle things out of court and were (and still are) hopeful that an agreement would be made shortly. The AUDL is committed to pushing the sport forward and will continue to do so in the future. We are sorry for the impact that this has on the teams and fans and will work to correct this. Certainly there are many challenges that a new league faces and we are continually grateful for the many people that have supported us along the way. 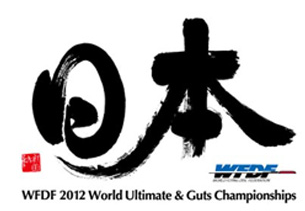 The World Flying Disc Federation's 2012 Ultimate and Guts Championships are scheduled in Sakai, Osaka, Japan over July 7-14. 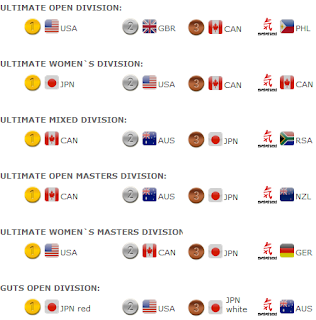 The championships are currently held over 4 years, and each participating country is allowed to send one team in each division. 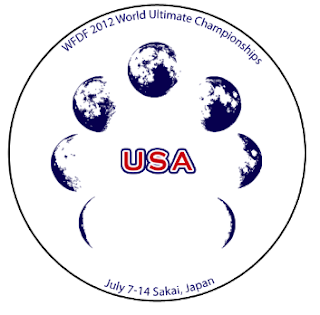 Info: Revolver - from San Francisco, California, is representing USA Ultimate in the WFDF 2012 Ultimate Championships (July 7-14th) for the Open Division in Japan. This 175g white disc provides support to their effort as Team USA in Sakai, Japan. The design updates Revolver's traditional logo with "USA" text. This clothing is literally SO COOL! The question for Ultimate teams is: Can it be sublimated? Would wearing this cool clothing be in violation of this Ultimate rule under IV. Equipment? B. Players may wear any soft clothing that does not endanger the safety of other players or provide unfair advantage. Info: This active cooling technology makes use of moisture to lower the temperature of the fabric, so it feels cool to the touch, and so you stay extra comfortable in hot conditions. The difference from wicking materials is blue rings of cooling polymer cover the garments, which swell when exposed to moisture -- letting air pass around you. Shirts, pullovers, hats, fingerless gloves and shorts. Another frisbee comic; another broken window. "...because outdoor frisbee just seemed so boring." Ultimate Borrowing Odds: What are the chances?